CWMAMMAN IN THE GOOD OLD DAYS. This a picture of a portion of old Cwmamman together with several of its best known inhabitants at the time it was taken. In front of Brynlloi Toll-house is the tab!e of rates, and Miss Thomas, the collector, is seen at the door. All those who appear in the picture were a peaceful and law-abiding lot, but stormy scenes were witnessed on this very spot when Rebecca and her daughters marched through South Wales demolishing all toll-gates and demanding the abolition of tolls. At the door of the toll-house stands Miss Thomas (now Mrs. David Llewelyn, Bryngwyn House), on her right Mrs. Morgans, Brynlloi, better known to the present generation as Mrs. Daniels. Next to Mrs. Daniels is Ann Griffiths, Shop Fach, and her mother, Mrs. Mary Griffiths; then Edwin Griffiths, Factri, and with him his youngest sister Miriam (now Mrs. J. Rees. Llanelly). To the left of Mrs. Llewelyn is Miss Hannah Thomas Banwen; then old Danie Thomas, Gelliceidrym, and his wife Nansen. On the Cross Keys door is the late Mr. David Jones, landlord, and sitting by his side is Mrs. Jones, with her daughters - Mrs. W. Roberts, Mrs. Dd Rees, and Mrs. J. Leonard. The lads near the wall are Messrs. John, Hugh and James Jones. A record of a wedding between Daniel Jones and Ann Rees exists for August 8 1835 at Llanguick (Llan-giwg) parish church. Although this was a long-time nonconformist family (Welsh Independent Congregationalist - Annibynwyr) marriages before 1837 had to be conducted in a parish church. Ann Rees may have been baptised on 11 June 1813 as the daughter of Richard Rees a collier of Cilmangwin (Cilmaengwyn) and Anne. However, Richard is a name not used subsequently in the family, which makes this a doubtful supposition. Another possibility is that Ann was the daughter of Hugh Rees (c.1761-1849) and his wife Anne Griffith who married at the parish church on 4 April 1812 and were at Nantygaseg, Llanguick in the 1841 census and previously there in 1824 when a Catherine Rees was baptised by independent minister of Pant-Teg, Alltwen and Carmel. The Pant-Teg nonconformist baptism records show a Mary Jones - daughter of Daniel Jones Gellilwcafach, labourer in the parish of Llanguick and his wife Ann - born June 9 1836 and baptised June 16 1836 by Phillip Griffiths independent minister of Pant-Teg, Alltwen and Carmel. Gelli-Lwca-Fach is close to Saron Chapel, Rhydyfro. In the 1841 census Daniel and Anne were living at Kilypentan (Cil-y-Pentan, or Cilpentan) farm, Llanguick parish, Glamorgan. This property is now Cilpentan, Llwyncelyn Road, Tairgwaith, Gwaun-Cae-Gurwen. Daniel is shown as a farmer aged 30 and Ann as 25. (Adult ages were rounded down to the nearest five in that census). Their children were Mary aged 5, David Jones aged 2 and Hugh Jones aged 1. All were born in Glamorgan. In the 1851 census the family were at Nantygaseg, further down the valley towards Rhydyfro, listed as: Daniel Jones Head Mar 41 Farmer of 82 acres; Anne Jones Wife Mar 36 Farmer's wife; Mary Jones Daur 14 Farmer's daur; David Jones Son 13 Farmer's son; Hugh Jones Son 11 Farmer's son; Elizabeth Jones Daur 8 Farmer's daur; Anne Jones Daur 5 Farmer's daur; all born Llanguick Glamorganshire. In 1861 the family were at Gellygeidrimisaf in Bettws parish, Carmarthenshire (now Glanaman) and listed as: Daniel Jones Head Mar 52 Farmer of 60 acres; Ann Jones Wife Mar 49 Farmer's wife; David Jones Son Un 23 Farmer's son; Ann Jones Daur Un 16 Farmer's daur; all born Llanguick Glamorganshire. In 1871 Daniel and Ann were still at Gelly Ceidrim. He was described as a farmer of 57 acres. With them was grandson David Williams aged 9, born Carmarthen Bettws. By 1881 Daniel (73) and Anne (67) had retired to Prospect Place listed on the census between the Half Moon Public House and an Independent Chapel. Daniel Jones (78) died March 16 1888 (Llandilofawr Vol 11a page 595) at Prospect Place, Cwmamman. His death was registered by his son David Jones of the Cross Keys Inn. In 1891 Anne Jones (78) widow was listed as a retired farmer at Gate House in Glanaman with a lodger Rachel Morriss (25) a tin worker born Morriston. In 1901 Anne Jones (88) was living on her own means in the Toll House next to the Cross Keys Inn in Glanaman. One can assume that Gate House and Toll House were the same. She died August 10 1903. Daniel Jones was known as Daniel 'Clip' because one eye was covered by a patch. They thought he had been born in Cilpentan, GCG but this seems to refer to their grandmother Elizabeth Jones. They eventually moved to a farm in Glanaman. Daniel Thomas (their father's brother) had a photograph of them - probably passed on to other relatives - that Sarah remembered. Daniel Clip was standing wearing a stove-pipe hat and frock-coat with Anne sitting with lace bonnet. Sarah also remembered an incident related by her father. Daniel, who apparently liked his beer and frequently returned home from the Cross Keys on a pony - more often on its own memory than any guidance from Daniel. On one occasion he gave someone a lift on the back of the pony and galloped up the slope to find, on reaching the Half Moon, that she was no longer behind him! Anne was known as 'Mamgu Gât' to her family because she lived for a time in the Toll Gate House near the Cross Keys Inn. She lived there after Daniel's death and then, when she became infirm, moved in with 'Mamgu Betty' (her daughter Elizabeth). Sarah remembered taking care of her on one occasion when Betty had gone out. She had been on strict orders not to allow Anne out of the bed - which was in the kitchen, However, she was bribed with a sixpence. Some time later (days...weeks) Anne tripped over a ladder in the garden and the shock of the fall hastened her death. Hwyr dydd Llun, 10fed cyf., synwyd ardal Glanamman a'r cylch gan y newydd prudd i fod yr hen chwaer Mrs Ann Jones (Modryb Nansen), gweddw y diweddar Mr. Daniel Jones, Gelliceudrim gynt, a mam yr anturiaethwr glofaol enwog - y diweddar Mr. David Jones, sylfaenydd y Cwmni - D. Jones and Sons, glofeydd y Cawdor, Garnant, wedi marw mewn modd tra anisgwyladwy yn ei 90 mlwydd oed. Y dydd Gwener canlynol rhoddwyd ei rhan farwol i orphwys ei holaf hun yn yr un bedd a'i diweddar briod, yr hwn oedd wedi ei rhagflaenu i'w weli prydd yn mynwent Carmel, Llangiwc, ers tua 15 mlynedd ynol. Symudodd yr ymadawedig i fyw at ei merch, Mrs E. Thomas, Grenig Road, er ys tua thri mis yn ol, lle yr anadlodd ei holaf ar ol ond ychydig gystudd a dihoender henaint. Yr oedd o gorph cryf, o nodwedd hen gedyrn y dyddiau gynt, a mwynhaodd iechyd neillduol dda ar hyd ei hoes. Bu yn wraig ffyddlon ac ymdrechgar, yn fam dda ac anwyl ac yn gymodoges hawddgar a chymwynasgar. In 1871 David Jones and wife Mary were in the Cross Keys (see photo at the top of this page) with sons John Jones (8), Daniel Jones (7), Thomas Jones (5), daughter Anne Jane Jones (2) and infant Hugh Jones of 11 months. By 1881 they also had James Jones (7), Mary Hannah (6), Lizzie (3) and servant Ann Morgans in the Inn. An application from David Jones, Cross Keys, Cwmamman, which was partly considered at last meeting, was the first subject that gave rise to much consideration. Mr Jones, it appears, has built an addition to his house, and the outlook from the windows of the new building is directly interrupted by the Brynlloi toll house. Mr Jones offers to give a nice piece of land as the site of a new and larger toll.house just across the road at the other side of the gate, but that would involve expense, and the present house appears to be sufficient for its purpose. All things considered, the County Roads Board on this occasion resolved that the clerk should write to Mr David Jones informing him that, as at present advised, they could not entertain his proposal. CWMAMMAN. GALLANTRY OF MINERS -On Wednesday the Royal Humane Society awarded silver medals to Aaron Williams and David Jones, colliers, for saving the life of Thomas Roberta, at Dynevor, or Glanamman, Colliery Carmarthenshire, on January 6tn. Roberts and another were ascending the shaft when the winding gear became unmanageable. On reaching the surface Roberts jumped out, but fell back again to the buttom of the pit, into 40 feet of water. The other man was killed. Williams and Jones went down a rope of doubtful strength, found Roberts, fastened him with a rope, and all were hauled safely to the surface. The aventure was regarded as a very dangerous one by the committee of the society. CWMAMAN, SIR GAER. Dydd Sadwrn, y 5ed cyfisol, cynaliwyd cyfarfod yn Hen Ysgoldy Brynlloi, er cyflwyno Medals y Royal Humane Society, yn nghyd ag anerchiadau ysblenydd i Mri. David Jones ac Aaron Williams, am eu dewrder yn nglyn a'r ddamwain yn hen lofa y Dynevor ar y 6ed o Ionawr diweddaf. Cymerwyd y gadair gan yr haelfrydig Dr. Rees, Tirbach, yr hwn a gyfranodd benadur at yr anerchiadau, y rhai a gyflwynwyd gan Mri. David Jones (gynt o'r Cross Keys; a William Rees, Cwmgrenig; a chyflwynwyd y Medals gan Dr. Rees a Miss Johns, boneddiges o Abertawe, tad yr hon a draddododd araeth Seisnig ar yr achlysur. Canwyd gan Miss Miriam Griffiths, yr hon a ddylai gael cefnogaeth i gael addysg gerddorol. Cafwyd anerchiadau barddonol gan D. Grenig, Trumor Thomas, Eos Nantyrafr, ac ereill. Terfvnwyd y cyfarfod trwy ganu Hen Wlad fy Nhadaa," Miss Miriam Griffiths yn canu yr unawd, a'r gynulleidfa yn uno yn y gydgan. D. G. R.
Tarian Y Gweithiwr August 14 1902 - Marwolaeth. Blin genyf gofnodi hanes marwolaeth fy nghyfaill anwyl a diymhongar, Mr David Jones, Cowdors (sic) Colliery, Garnant. Cwmamman yn didiweddar. Adnabyddir Mr Jones wrth. yr enw "Dafydd Cross Keys," Cwmann (sic) Bu yn cadw y gwestdy uchod am flynyddau lawer. Bu hefyd yn ddyn cymhwys a gonest vn y fasnach hono. fei yr oedd yn mhob peth arall yn ei rawd. Agorodd, a suddodd amryw o lofeydd yn ei amser cyn yr uchod; ni fu yn llwyddianus iawn yn yr un o honynt cyn y lofa hon; ond dangosodd ddigon o galon i anturio i suddo:at y diamwnt du hyd y diwedd. Dyn difalch iawn oedd Mr Jones yn mhob cyfeiriad, ac ni annghofiodd un o'i hen gyfoedion wedi iddo lwyddo o gwbl Hyderaf y bydd i'w fechgyn ddilyn yr un llwybrau, pa rai sydd yn arolygu y lofa ar ei ol. Yr eiddoch, yn gywir, Talfryn. Amman Valley Chronicle November 6 1913 - DEATH OF AN OLD INHABITANT.-We regret to announce the death of Mrs. Mary Jones, Cross Keys, at the age of 76 years. The deceased lady was well known as one of the old natives, and highly respected. She leaves four sons and three daughters to mourn their loss. The funeral took place on Tuesday at Tabernacle, and was largely attended. Mr. Oliver and the minister officiated. 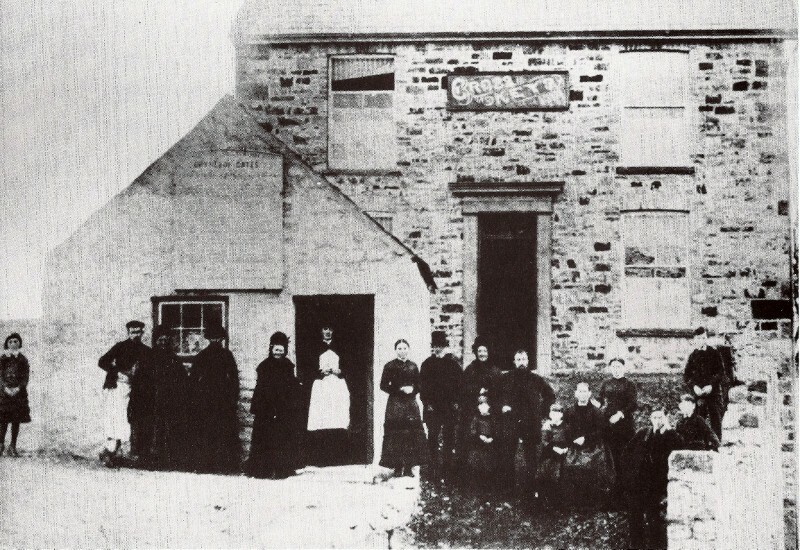 At the Cross Keys with sister Mary Williams and her husband in 1861 as an unmarried coal miner. In 1871 he was in Fforest Fach, Swansea with wife Jane ? (28), son Daniel Jones, (6 months) both born Swansea and boarder Thomas Davies (20) born Carmarthenshire. INQUEST. - An inquest was held on the 31st ult., before the deputy-coroner, Mr. Gaskoin, at the Star public-house, Forest Fach, touching the death of a collier named Hugh Jones, aged 32 years, employed at the Cwmbwla colliery. Deceased, contrary to the rules, on the 30th, descended the slant in a tram, the chain of which broke, causing deceased to receive such injuries that he died the following day. A verdict was returned in accordance with the evidence adduced. In 1871 Elizabeth was living with her husband Thomas Thomas at Garnant Road, Bettws parish: Thomas Thomas Head Mar 32 Coal hewer Born Carmarthen Bettws; Elizabeth do Wife Mar 29 Born Glamorgan Llanguick; Hannah Thomas Daur 5 Born Carmarthen Bettws; Margaret Thomas Daur 4 do; James Thomas Son 1 do. By 1881 they had moved to the family farm on the mountainside. More at The Thomas Family of Banwen farm, Glanaman for further information. By 1881 Daniel's youngest daughter Ann (36) was back in Gellyceidrim with husband Rees Williams (34), farmer (of 50 acres) daughter Gwenny Williams (2) - known later as Jenny Williams (25 November 1878 - 29 March 1945). In 1891 Ann and Rees Williams (born Gwynfe) were still farming at Gellyceidrim with children Genny (12), David Williams (May 11 1883 - ) and Daniel John Williams (June 16 1889 - ). In 1901 Ann Williams (widow, 55) was at Gelliceidrim farm with her children Jenny (worker, 22), David (student, 17) and Daniel J. (11). Jenny married William Rees (4 May 1875 - 14 April 1949) in 1904 (Llandilofawr, March quarter, vol 11a, page 1369). Grenigwen Rees (May 13 1905 - October 8 1978) who resided at 8 Llwyncelyn Road, Glanaman when she died. John Rees (November 12 1906 - September 28 1978), a Bank Clerk in 1939. Resided at Maes Sannan, 2 Llwyncelyn Road, Glanaman when he died. Rees Rees (aged 2 in 1911). They were at Cwmgrenig farm in 1939 with Grenigwen and John. Jenny resided at Maesannan, Llwyncelyn Road when she died in 1945, administration given to William Rees, retired farmer. William died at the same address in 1949, administration to John Rees, Bank Clerk. David Williams was educated at Brecon Memorial College and ordained as minister of the Ffaldybrenin and Esgerdawe Congregational Churches in August 1913 and remained there until 1928: He married Rachel Mary Jones (August 6 1894-February 1940). In 1939, he was a retired Congregational Minister living at Wenllys, Lampeter, Cardiganshire. Amman Valley Chronicle April 16 1914: BRYN SEION.-The Rev. David Williams, B.A., late Gelliceidrym, officiated on Sunday last. As usual Mr. Williams was interesting and sweet. By all accounts his pastorate at Ffaldybrenin is highly successful. Paradwvs y Priodi.- Yn Esgairdawe pa ddydd, rhwymwyd yn ngefynnau euraidd priodas y cyfaill diymhongar, y Parch. David Williams, B.A., gweinidog gyda'r Anibynwyr yn Ffaldybrenin ac Esgairdawe, a Miss Rachel Mary Jones (May), merch ieuengaf y Cynghorydd adnabyddus, Mr. T. F. Jones, Troedybryn, Llanycrwys, a Heol y Pare, Abertawe. Cylymwyd y rhwymyn gan y Parchn. Evan Evans, Llanbedr Pont Stephan; J. Towyn Jones, A.S.; D. Eurof Walters, M.A., Abertawe; J. Edryd Jones, Cwmaman; a Rufus Rogers, B.A., Caio. Brodor o Gellyceidrim, Cwmaman, yw y priodfab, ond yn awr yn weinidog llwyddiannus ar eglwysi parchus yn ardal enedigol yr hynod a'r enwog Kilsby Jones. In 1939 Daniel John Williams was a Dairy Famer at Gelly Ceidrim with incapacitated wife Margaret Jane Rees (September 16 1885 - ), Dairy Maid daughter Rachel Williams (April 15 1919 - ), and son David C Williams (September 20 1927 - ).